This grilled chicken arugula salad is full of amazing, fresh flavor! And it’s easy to make, delicious and healthy! 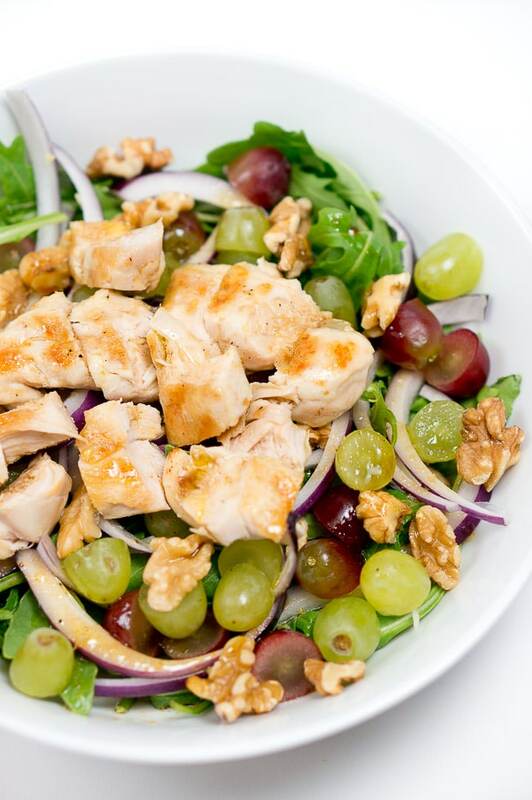 The green and red grapes add a nice sweetness to this chicken salad combined with the honey balsamic vinaigrette. And I added some chopped walnuts for a little crunch. I love the fact that this grilled chicken arugula salad takes literally about 10 – 15 minutes to make and it’s perfect for lunch, or dinner on a busy weeknight. The ingredients are simple, and no prep work is required (except for the grilled chicken). Sometimes on weekends, I would grill a batch of chicken breasts seasoned with salt and pepper and store them in a ziplock bag in the refrigerator. I then use them during the week for quick recipes like this one. So convenient, and it makes eating healthy so much easier and stress-free. 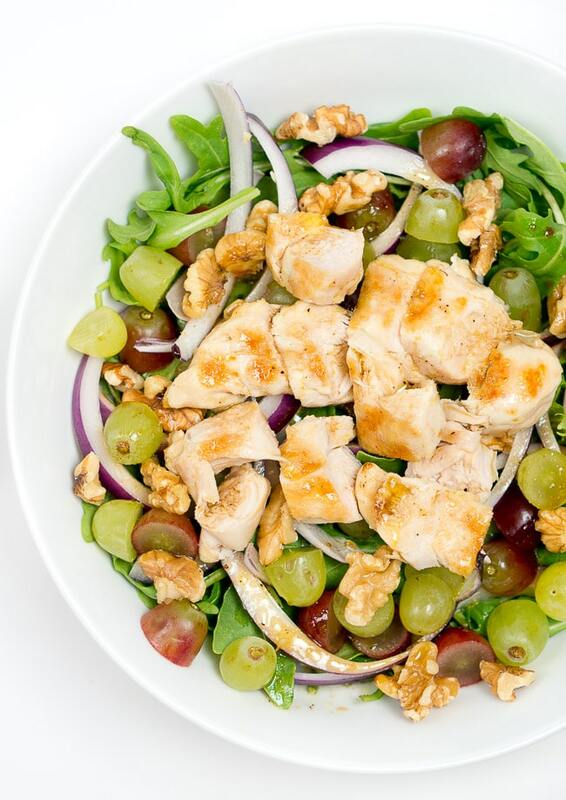 Add arugula, grapes and red onion to bowl, and toss to combine. Top each bowl with 1/4 of the grilled chicken breasts. Sprinkle some walnuts and drizzle with vinaigrette. serve immediately. Whisk all ingredients together for about 30 seconds until combined. This salad was wonderfully light and flavorful and yet filling. I am planning to make it more often because it’s seriously that good! This grilled chicken arugula salad is full of amazing and fresh flavor! And it's easy to make, absolutely delicious and healthy! Thanks, Laura! 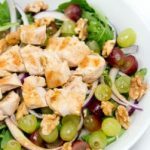 I love grapes in salads, and they go really well with the chicken here. 🙂 Thanks for sharing! I’m not a salad girl and this looks simply amazeballs to me! Yummers! This looks amazing! So perfect! Love grilled chicken and I have a huge obsession with arugula! Plus…the grapes 😉 Perfect sweetness! 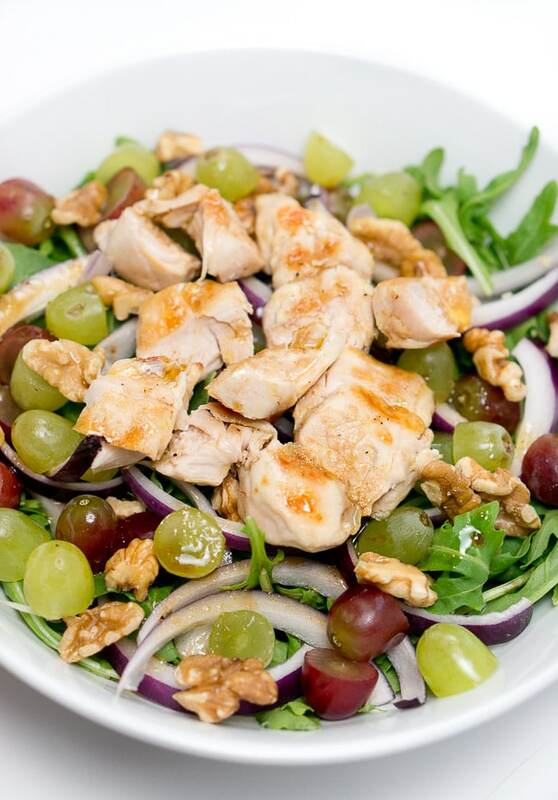 I love the sweet of the grapes, savoury chicken with the peppery arugula. Looks like the perfect dinner or lunch! Just pinned! Oh yes, topped with goat/feta cheese sounds great! Anything with arugula in it is a winner to me. I know, It’s my favorite green to add to salads! 🙂 Thanks for stopping by! I LOVE the look of this recipe and am so excited to try it. The only thing I might omit are the red onions because I don’t tend to like onion in my salad, but otherwise I couldn’t be more excited. Thanks so much for sharing! This looks delicious! I’m a huge fan of quick and easy salads and I love the addition of grapes. Can’t wait to try! Thanks Lisa! 🙂 Hope you like it! Oh man! This looks super yummy!! I have been looking for some summer time recipes that highlight the fresh produce, and I think I am going to have to try this one! 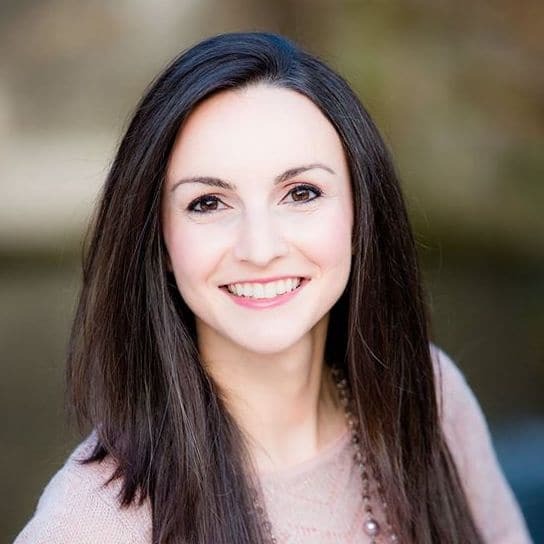 Great post and thank you! I love that I came across this. I have been on a salad kick lately. They have been so delicious! I definitely want to try this one I love arugula. This salad looks amazing! I love the sweet grapes in here! It sounds perfect with the chicken and arugula!